The diagnosis of lymph node metastasis in esophageal cancer by the presence and number of metastatic lymph nodes is an extremely important prognostic factor. In addition, the indication of non-surgical therapy is gaining more attention. Vascular endothelial growth factor C (VEGF-C) is potentially lymphangiogenic and selectively induces hyperplasia of the lymphatic vasculature. In this study, we investigated the expression of VEGF-C and whether it correlated with various clinico-pathologic findings. KYSE series of esophageal cancer cell lines and 106 patients with primary esophageal squamous cell carcinomas who had undergone radical esophagectomy were analyzed. VEGF-C mRNA expression was determined by quantitative RT-PCR. High expression of VEGF-C was detected in most of the KYSE cell lines, especially KYSE410, yet, in an esophageal normal epithelium cell line, Het-1A, VEGF-C was not detected. In the clinical specimen, the expression of VEGF-C in the cancerous tissue was higher than in the corresponding noncancerous esophageal mucosa (p = 0.026). The expression of VEGF-C was found to be higher in Stage2B-4A tumors than in Stage0-2A tumors (p = 0.049). 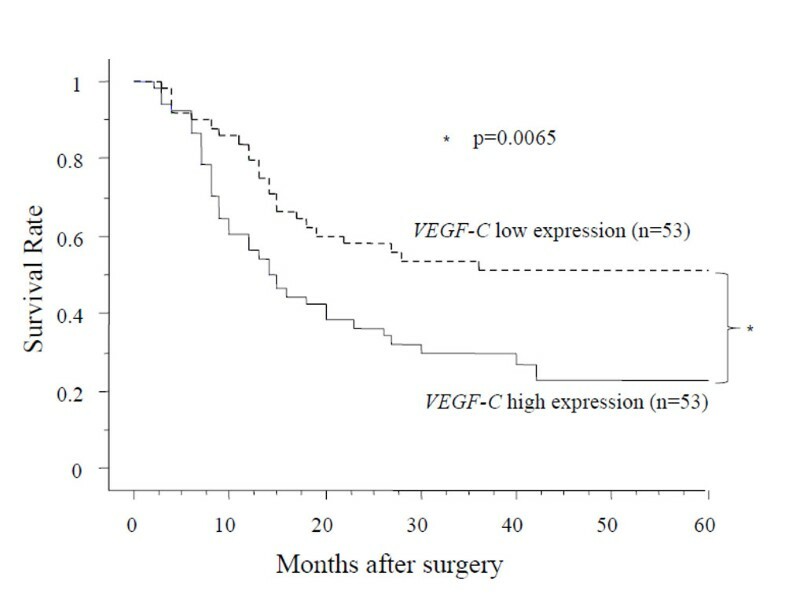 When the patients were divided into two groups according to their expression levels of VEGF-C (a group of 53 cases with high expression and a group of 53 cases with low expression), the patients with high VEGF-C expression had significantly shorter survival after surgery than the patients with low expression (p = 0.0065). Although univariate analysis showed that high expression of VEGF-C was a statistically significant prognostic factor, this was not shown in multivariate analysis. In the subgroup of patients with Tis and T1 tumors, the expression of VEGF-C was higher in N1 tumors than in N0 tumors (p = 0.029). The survival rate of patients from the high expression group (n = 10) was lower than that in the low expression group (n = 11), and all the patients in the low VEGF-C expression group survived. The expression of VEGF-C correlates with lymph node metastasis and poor prognosis. In patients with Tis and T1 esophageal tumors, the expression of VEGF-C may be a good diagnostic factor for determining metastasis of the lymph node. Esophageal cancer is a disease with poor prognosis. Of many prognostic factors, the metastatic lymph nodes are one of the most significant. To avoid highly invasive surgery, endoscopic mucosal resection (EMR), endoscopic submucosal dissection (ESD), chemoradiotherapy, and their combinations have been suggested for patients with early esophageal cancer. When applying these non-surgical treatments, preoperative diagnosis of tumor invasion and lymph node metastasis becomes especially important. Unfortunately, computed tomography (CT) and positron emission tomography (PET) are unable to diagnose lymph node metastasis accurately. In order to develop plans for new diagnoses and treatment, it is essential that the biological behavior of esophageal cancer be understood. Recent studies have revealed that several genes and molecules are involved in the origin and/or progression of esophageal cancer, including TP53[1, 2], deleted in esophageal cancer 1(DEC1) , deleted in colorectal cancer (DCC) , deleted in lung cancer 1(DLC1) , cyclinD1[6, 7], transforming growth factor-beta receptor type II (TGFBRII) , adenomatous polyposis coli (APC)[9, 10], survivin, and murine double minute 2 (MDM2). However, the precise mechanisms that underlie the development and progression of esophageal squamous cell cancer (ESCC) are far from clear. VEGF-C has been characterized as a lymphangiogenic and angiogenic growth factor and has been shown to signal through the receptors VEGFR-3 (also called Flt-4) and VEGFR-2 . In this paper, we report the relationship between the expression of VEGF-C, the clinico-pathological factors, and the prognosis of patients with ESCC. Samples were obtained from 106 patients (87 males and 19 females) with ESCC who had undergone radical esophagectomy at the Department of Surgery II, Nagoya City University Hospital, between 1996 and 2005. The study design was approved by the Institutional Review Board of our university, and written consent was obtained from all patients. Tumors were classified according to UICC. All samples were frozen immediately in liquid nitrogen and stored at -80°C until use. Characteristics of the 106 patients with ESCC are shown in Table 1. The SV40-immortalized esophageal cell line Het-1A was purchased from the American Type Culture Collection (Manassas, VA, USA). KYSE series was obtained from the DSMZ German Collection of Micro-organisms and Cell Cultures (Braunschweig, Germany). KYSE esophageal cancer cells were plated in tissue culture dishes and grown in RPMI-1640 medium (Sigma, St. Louis, MO, USA) with 10% fetal bovine serum (JRH Bioscience, Kansas, USA), at 37°C in a humidified atmosphere of 95% air and 5% CO2. Het-1A cells were grown in LHC-9 serum-free medium (Biofluids, Rockville, MD, USA) in tissue culture dishes at 37°C in a humidified atmosphere of 95% air and 5% CO2. Total RNA was extracted from esophageal cancer tissue, and from corresponding noncancerous esophageal mucosa taken from apparently normal mucosa as far away from the tumor as possible, using an Isogen kit (Nippon Gene, Tokyo, Japan), according to the manufacturer's instructions. Total RNA was extracted from the cell lines in the same way. The concentration of total RNA was adjusted to 200 ng/ml using a spectrophotometer. The reverse transcription reaction was performed using 1 μg of total RNA, 0.5 μg of oligo (dT) primer and Superscript II enzyme (Gibco BRL, Gaithersburg, MD, USA), for 60 min at 37°C, followed by 10 min 90°C and 10 min at 70°C. Gene expression in all samples was measured by quantitative RT-PCR using the Applied Biosystems 7500 Fast Real-Time PCR System (Applied Biosystems, Foster City, CA, USA). PCR was performed in a 20 μl reaction mixture containing 10 μl TaqMan Universal PCR Master Mix (Applied Biosystems), 80 nM of each primer, 2 nM of probe, and 2 μl of cDNA sample. The thermal cycling conditions included an initial denaturation step of 95°C for 20 seconds, followed by 40 cycles at 95°C for 3 seconds and annealing at 60°C for 30 seconds. Relative mRNA expression levels were normalized to glyceraldehyde-3-phosphate dehydrogenase (GAPDH). PCR primers and fluorogenic probes for the target gene and endogenous controls were purchased from Applied Biosystems. The assays were supplied as a 20× mix of PCR primers and TaqMan minor groove binder 6-FAM dye-labeled probes with a non-fluorescent quencher at the 3'-end of the probe. The assay numbers for GAPDH and VEGF-C were as follows: Hs99999905_m1 (GAPDH), Hs01099206_m1 (VEGF-C). Relative mRNA expression levels (log10VEGF-C/GAPDH) were calculated from quantified data relative to the expression level of GAPDH. Data is expressed as the mean ± SD. Statistical analysis was performed using the Stat-View software package (Abacus Concepts, Berkeley, CA, USA). Mann-Whitney U test was used to analyze the association between mRNA expression levels and the clinical histopathological parameters of the patients. The survival of patients with ESCC after surgery was examined using the Kaplan-Meier method, and the survival times were compared using the log-rank test. Univariate analysis and multivariate analysis was performed using the Cox's regression model. P-values were considered significant at p < 0.05. We first investigated the expression of VEGF-C in 12 esophageal cancer cell lines (KYSE30, KYSE50, KYSE70, KYSE110, KYSE140, KYSE150, KYSE180, KYSE270, KYSE410, KYSE450, KYSE510, KYSE520), and in the Het-1A cell line. 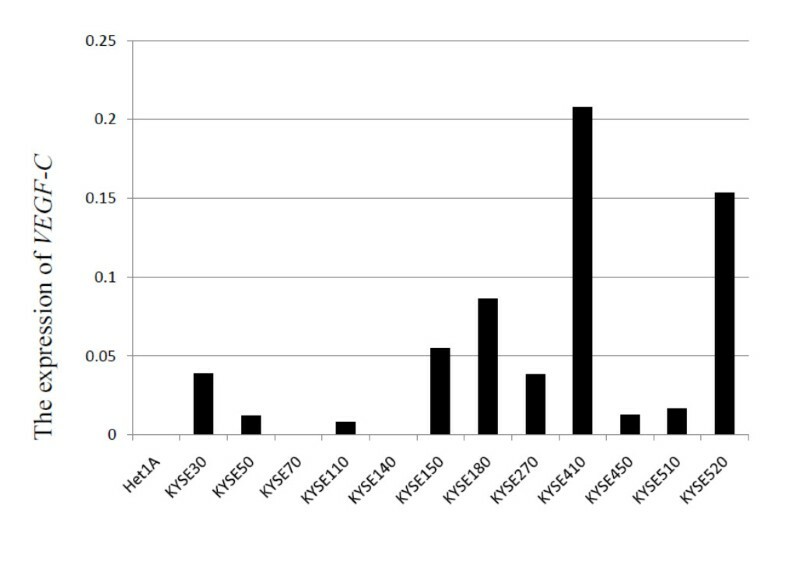 In most of the KYSE series of cell lines, especially KYSE410, high levels of VEGF-C were detected, yet in Het-1A, VEGF-C was not detected at all (Fig. 1). The expression of VEGF-C in esophageal cell lines. Most KYSE cell lines express VEGF-C. Het-1A cells do not express VEGF-C.
We next examined VEGF-C expression in 106 pairs of resected ESCC tumors and in corresponding noncancerous esophageal mucosal tissue specimens. Our data reveals that VEGF-C expression in cancerous tissue is higher than in corresponding noncancerous esophageal mucosa (Fig. 2a). We also examined the relationship between the clinico-pathological factors and the expression of VEGF-C in ESCC. The expression of VEGF-C was found to be higher in Stage2B-4A tumors than in Stage0-2A tumors (Table 1, Fig. 2b). We also examined the relationship between the expression of VEGF-C and the survival data. The patients were divided into two groups according to the expression of VEGF-C. The cut off value was median expression of VEGF-C (high expression group of 53 cases and a low expression group of 53 cases). The patients in the high VEGF-C expression group had significantly shorter survival after surgery than the patients in the low expression group (p = 0.0065 by log-rank test; Fig. 3). Univariate analysis showed that, among the clinico-pathological factors, the extent of the primary tumor, lymph node metastasis, and high expression of VEGF-C were all statistically significant prognostic factors (Table 2). Multivariate analysis showed that the extent of the primary tumor and lymph node metastasis were independent prognostic factor (Table 3). Comparison of mRNA expression of VEGF-C in cancer and corresponding noncancerous esophageal mucosa (a) and in Stage0-2A patients and Stage2B-4A patients (b). The VEGF-C expression in ESCC tumors is significantly higher than in the corresponding noncancerous esophageal mucosa (a). The VEGF-C expression is higher in Stage2B-4A patients than in Stage0-2A patients (b). We next analyzed a subgroup of patients with Tis and T1 tumors (Table 4). In this subgroup, we examined the relationship between the clinico-pathological factors and the expression of VEGF-C in ESCC. 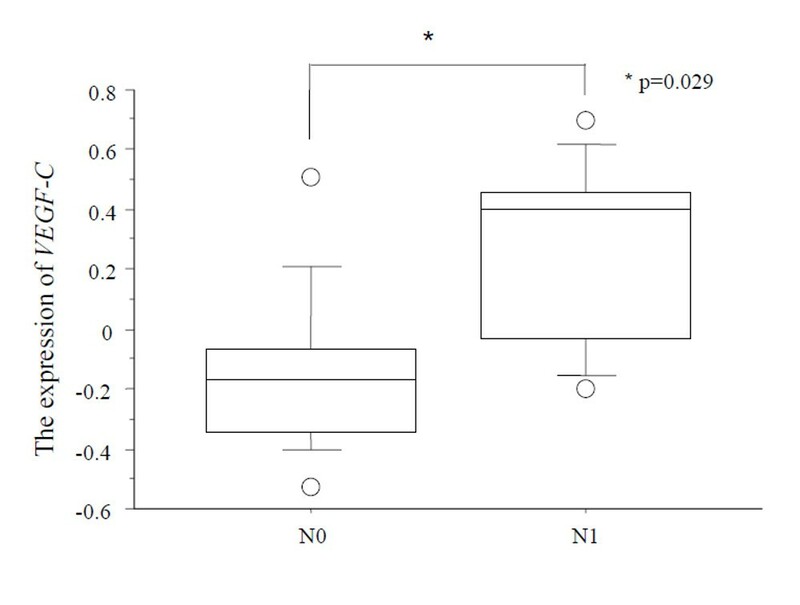 The expression of VEGF-C was found to be higher in N1 tumors than in N0 tumors (Table 4, Fig. 4). The expression of VEGF-C was found to be higher in T1 and Stage2A, 2B tumors than in Tis and Stage0-1 tumors (Table. 4). We also examined the relationship between the expression of VEGF-C and the survival data. The patients were divided into two groups according to the expression of VEGF-C. The cut off value was median expression of VEGF-C (a high expression group of 10 cases and a low expression group of 11 cases). 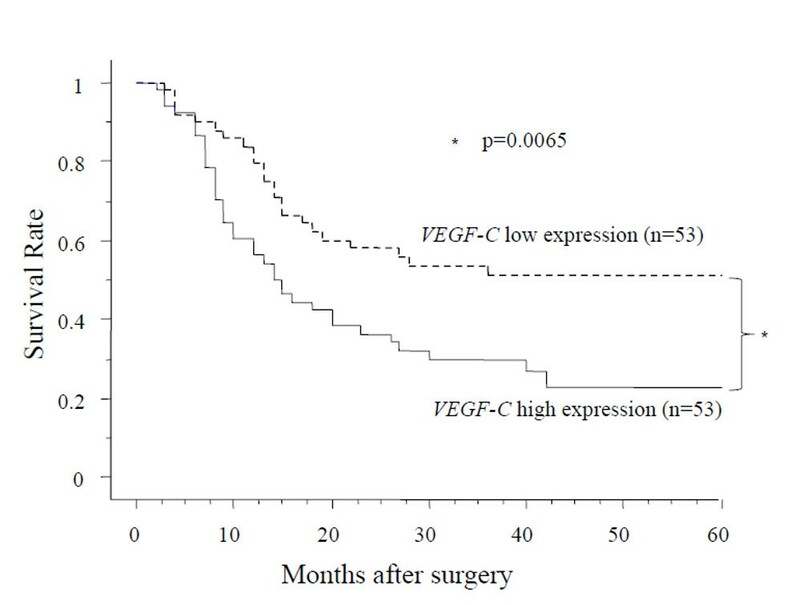 The survival rate of the patients in the high expression group was clearly lower than that in the low expression group, and all the patients in the low VEGF-C expression group were survived (data not shown). The mRNA expression of VEGF-C in Tis and T1 ESCC tumors. The expression of VEGF-C is higher in N1 tumors than in N0 tumors (p = 0.029). The vascular endothelial growth factor (VEGF) gene family, which encodes five polypeptides, VEGF-A, -B, -C, -D, and -E, is particularly important because of its angiogenic and lymphangiogenic properties . VEGF-C has been shown to signal through the receptors VEGFR-3 (also called Flt-4) and VEGFR-2 . VEGFR-3 has also been shown to be important in determining the potential for a lymphangiogenic response. Recent studies have indicated that VEGFR-3 is expressed in a variety of human malignancies . The expression of VEGF-C and VEGFR-3 has been significantly and negatively correlated to the progression of gastric cancer , cervical cancer , colorectal cancer , and head and neck squamous cell carcinoma . In esophageal cancer, few studies have dealt with the relationship between VEGF-C expression and tumor progression or prognosis. Ishikawa et al investigated the expression of VEGF-C in esophageal carcinoma, dysplasia, and normal mucosa by immunohistochemistry. The authors reported that all esophageal carcinomas clearly expressed VEGF-C. In esophageal dysplasia, 82% of the cases expressed VEGF-C. In contrast, none of the esophageal normal mucosa expressed VEGF-C. In the study by Ming-Xing Ding, the expression of VEGF-C mRNA was higher in esophageal carcinoma than in normal tissue . In our study, most of the KYSE cell lines expressed VEGF-C, the SV40-immortalized esophageal cell line Het-1A did not express VEGF-C mRNA, and the expression of VEGF-C in cancerous tissue was higher than in corresponding noncancerous esophageal mucosa. This suggests that VEGF-C may play an important role in tumor progression. Okazawa et al. reported that VEGF-C expression correlated with the depth of tumor invasion, lymphatic invasion, and lymph node metastasis in esophageal cancer. They also claimed that the prognosis was significantly worse for patients with tumors positive for VEGF-C than for those with tumors negative for VEGF-C, and that VEGF-C expression was an independent prognostic determinant . The discrepancy between their report and present study may be from methodology. They investigated 100 tumors by immunohistochemistry, and treated 43% of VEGF-C positive cases. Esophageal carcinoma most likely metastasizes in lymph node, which correlates with the prognosis of the patients. In this study, the expression of VEGF-C mRNA correlates with lymph node metastasis, and the patients with high VEGF-C-expressing tumors have a poorer prognosis than those with low VEGF-C-expressing tumors. To avoid highly invasive surgery, EMR, ESD, chemoradiotherapy, and their combinations have been indicated for patients with early esophageal cancers. In the non-surgical treatment of early esophageal cancer, a high rate of local recurrence and lymph node metastasis is evident . For non-surgical treatment, particularly ESD and EMR, preoperative diagnosis of lymph node metastasis is essential. However, the accuracy of diagnosis of lymph node metastasis by computed tomography is reported to be 11-38%, endoscopic ultrasound 75-76%, and positron emission tomography 30-52% [25–28]. The sensitivity of endoscopic ultrasound is high, yet it does not detect distant metastases . For the decision of non-surgical treatment, the sensitivity is just not high enough. Our study shows that expression of VEGF-C correlates with lymph node metastasis, and negatively correlates with survival in early squamous cell carcinoma. If early esophageal cancer expresses high VEGF-C, the patients have increased risk of lymph node metastasis and thus, a poor prognosis. Hence, the expression of VEGF-C may assist in the diagnosis of lymph node metastasis for esophageal superficial carcinoma. Although the precise molecular mechanisms of up-regulated VEGF-C expression need to be clarified, our data suggests that VEGF-C is a good candidate as a molecular prognostic marker as well as a molecular target for the development of effective treatment for patients with esophageal cancer. TT carried out most of experiments, participated in the design of the study, performed the statistical analysis and drafted the manuscript. HI, YF and HT participated in the design of the study and helped to draft the manuscript. YK participated in its design and coordination. MK, AM, TK, MS and YN assisted the experiments. All authors read and approved the final manuscript.